It’s the first birthday for Sing a Graveyard Song, the third book in the Enclave series by Remi Black. Follow the bound wizard Alstera as she ventures into the mountains and confronts a monster created from blood and power. Assassination. A fugitive comtesse. A lethal sleep-spell. Wyre and wraiths. Wizardry against sorcery. And regicide. In Dream a Deadly Dream, a sorcerer’s plot to kill the king weaves together past and present, dream and reality, to create a nightmare that can kill. For three years Cherai, the comtesse Muirée, has hidden from the conspirators who assassinated her father. Now, in the weeping season, a sorcerer has woven a lethal sleep-snare to entrap her. Although she doesn’t know it, she holds the key to the conspirators’ chance to seize the throne of Vaermonde, a chance thwarted when they killed her father too quickly. The poisoned nightmares sent by the sorcerer will compel Cherai to turn herself over to her father’s murderers. Only a chance-met wizard can free her from the sorcerous sleep-spell. Alstera wandered into Vaermonde, seeking an opportunity to rid herself of the bindings on her power. When she encounters Cherai, she realizes the nightmares are caused by a sorcerer. Breaking a simple sleep-spell without any expectation of extrinsic reward should remove one of the bindings. Selfishly, she attaches herself to Cherai. Yet the sleep-spell is not a simple one: it is a powerful sleep-snare, designed to kill once the conspirators have the document that Cherai’s father hid. Alstera must use forbidden blood-magic—another crime against wizardry—to slip her powers through the binding sigils tattooed on her wrists. Will the poisoned nightmares kill Cherai? Can Alstera free her from the sorcerer’s web before the conspirators kill the king? Threats come from both enemies and friends, from steely blades and magickal spells. Dream a Deadly Dream, a novel of 119,000 words, is the second book in the Enclave series. Enclave 1: Weave a Wizardry Web explores Alstera’s crimes, for which she was bound and banished. While Dream is a continuation of Alstera’s story in Web, both novels are complete and without cliff-hangers. “Into the Labyrinth” is Remi Black’s story of her passage to publication. 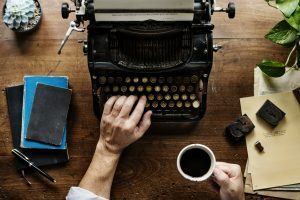 She offers it as advice for new writers just beginning their journey. I have written stories all my life. I enjoy opening the great door into the unknown of story, each step lighting a path that once was only darkness. then enter the labyrinth of story, hoping to defeat the monster before it eats them. 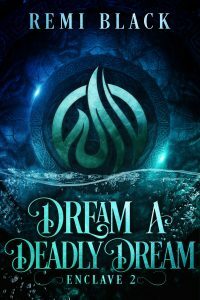 Several, several years ago, after I had written a few manuscripts, growing as a writer with each one, I penned Dream a Deadly Dream. I sent out the original manuscript with great hopes. And it bounced back, usually with a “nice” rejection letter attached. In the recently-revived war between wizards and sorcerers, the Enclave wizards enlist the aid of Rhoghieri, wielders of the four base elements who live in Havens. The sorcerers have enslaved wyre, animal shifters who became outcasts when the wizards declared them anathema. The Faeron, who withdrew when the dragons were defeated and nearly extinguished from the world, have returned to an uneasy alliance with the wizards—for the dragons did not die out centuries ago. Those nearly-mythic creatures are searching for a way to return so they can wreck vengeance on the Faeron and the wizards who exiled them. Brantimor. Clan Pater in 620. Red with Gold / Fire. Magister Amiste. Fae comeis Tithran Oran de Ciele. Sequence of Clan Leadership: Brantimor < Ignace (Border Wars) < Guyot, who became ArchClans in 566 < Evraud, who became ArchClans in 541 < Franchot (Saldoran’s Revolt) < Cosmée (killed in battle during Saldoran’s Revolt) < Salbourne < year 463 clan split with the clan that becomes duCian < Chamisse, who became ArchClans in 451 < Thibaut, founder. Bronchet. Clan Pater in 616. Blue with Gold / Water with Fire. Magister Beatrice. Fae comeis Laidriv Grieze de Kiern. Sequence of Clan Leadership: Bronchet < Pierrell (Border Wars) < Gismond, who became ArchClans in 576 < Sandoire < Gauthier, who became ArchClans in 536 (Saldoran’s Revolt) < Odette (killed in battle during Saldoran’s Revolt) < year 494 clan split with the clan that becomes Rochein < Hellost < Alaric < Carrock, founder. Charanaise. Clan Mater in 635. Green with Gold / Earth and Fire. Magister Piers. Fae comeis Tolki Regnant de Thettis. Sequence of Clan Leadership: Charanaise < Gerrault < Teobolt (Border Wars) < Ysador < Lisandre (Saldoran’s Revolt) < Giraud, who became ArchClans in 488 (killed in battle during Saldoran’s Revolt) < de Bohune < Brielle, who became ArchClans in 463 < year 461 clan split with the clan that becomes d’Aulnois < Telfourd < Pherginda, who became ArchClans in 439 and founder. d’Aulnois. Clan Pater in 631. Council of Five member. Green with Silver / Earth and Air. Magister Niels. Fae comeis Silmar Heim de Veirnt. Sequence of Clan Leadership: d’Aulnois < Bourdonnée (Border Wars) < Phergenie < d’Arcy < Horchadt, became ArchClans in 497 (Saldoran’s Revolt) < Aelwine < Guimalle, became ArchClans in 467 < year 461 clan split with the clan that becomes Charanaise < Telfourd < Pherginda, became ArchClans in 439 and founder. Drakon. Clan Pater in 596. Council of Five member. Black with Gold / (unacknowledged Chaos and) Fire. Magister Brandt. Fae comeis Huron Talenn de Ysagrael. Sequence of Clan Leadership: Drakon < Reivel, who became ArchClans in 578 (Border Wars) < Bronn < Tanneal, who became ArchClans in 514 (Saldoran’s Revolt) < Yvgny < Draiven < Brandt, who become ArchClans in 449 < Gerhardt, founder. DuCian. Clan Pater in 627. Red with Silver / Fire and Air. Magister Rowan. Fae comeis Vatar Regnant de Chardyss. Sequence of Clan Leadership: DuCian < Valmont < Raigneur (Border Wars) < Alysse < Telfor < Sebastien (Saldoran’s Revolt) < Léonor (killed in battle during Saldoran’s Revolt) < Anselm, who became ArchClans in 474 < year 463 clan split with the clan that becomes Brantimor < Chamisse, who became ArchClans in 451 < Thibaut, founder. Galfrons. Clan Pater in 610. Council of Five member. Grey with Silver / Water and Air. Magisters Eléonore and Talbot. Fae comeis Dagorr Sigis de Fanault. Sequence of Clan Leadership: Galfrons < Chambaud (Border Wars) < Harailt, who became ArchClans in 555 < Rombreaux (Saldoran’s Revolt) < Ferrant < Melisande < Jacinthe, joined as second generation after Carrock’s death in 426. Letheina. Clan Mater in 613, became ArchClans in 624. Blue with Silver / Water and Air. Magister Raigeis. Fae Ruidri comeis Talenn de Ysagrael. Sequence of Clan Leadership: Letheina < Saigeis, who became ArchClans in 596 (Border Wars) < Morted < Sygny (Saldoran’s Revolt) < Maltroit (killed in battle during Saldoran’s Revolt) < Romert < du Cyre, who became ArchClans in 444 < Raigeis, founder. Metallin. Clan Pater in 616. Council of Five member. Black with Silver / Air. Magister Tallost. Fae comeis Aegethr Bourne de Chardyss. Sequence of Clan Leadership: Metallin < Sholeina < Garnier (Border Wars) < Nellost < Piers, who became ArchClans in 524 (Saldoran’s Revolt) < Enjoux (killed in battle during Saldoran’s Revolt) < d’Ivrons, who joined the Enclave in the 3rd generation, 461. Perrault. Clan Pater in 606. Council of Five member. Brown with Gold / Earth and Fire. Magisters Cosmée and Oralia and Jules. Fae comeis Sullin Bourne de Chardyss. Sequence of Clan Leadership: Perrault < Griselt (Border Wars) < Aherin (Saldoran’s Revolt) < Horst (killed in battle during Saldoran’s Revolt) < Denis < Journet, joined as second generation after Carrock’s death in 426. Rochein. Clan Mater in 624. Yellow with Black / Earth and Air. Magister Seir. Fae comeis Menos Heim de Veirnt. Sequence of Clan Leadership: Rochein < Giraud, who became ArchClans in 613 < Euphemie (Border Wars) < Montaigne < Harcourt < Tredennit, who became ArchClans in 520 (Saldoran’s Revolt) < Costaigne (killed in battle during Saldoran’s Revolt) < year 494 clan split with the clan that becomes Bronchet < Hellost < Alaric < Carrock, founder. ArchClans Leadership < Letheina, 624 < Giraud, 613-624 < Saigeis, 597-624 < Reivel, 578-597 (Border Wars) < Gismond, 577-578 < Guyot, 566-577 < Harailt, 555-566 < Evraud, 541-555 < Gauthier, 536-541 < Piers, 524-536 < Tredennit, 520-524 < Tanneal, 514-520 < Horchadt, led during Saldoran’s Revolt, 497-514 < Giraud, killed during Saldoran’s Revolt, 488-497 < Anselm, 474-488 < Guimalle, 468-474 < Brielle, 463-468 < Chamisse, 451-463 < Brandt, 449-451 < du Cyre, 443-449 < Pherginda (last remaining of the original founders), 439-443 < original five founding members—Carrock, Gerhardt, Pherginda, Raigeis, and Thibaut—ruled by consensus from 382 to 439. Current Aged Sages (61st Iteration of the Council of Five): 1st = Perrault, 2nd = Galfrons, 3rd = Drakon, 4th = d’Aulnois, and 5th = Metallin. The Maorketh, sometimes called “the Kiern Alaisa”. Maorketh Alaisa Grieze de Kiern. Called the Chief Sister. Her ward (bonded mate) is Ivers, a wizard of Clan Letheina of the Enclave. Her palace is at the Harrows in the North. First Sister, the Fanault Alviss. Maore Alviss Sigis de Fanault. Her palace is at Dagomer, on the east by the sea. First Brother, the Ysagrael Tiraz. Maorn Tiraz Talenn de Ysagrael. Scree, the rocky and forested slopes leading down from Petrosse, is the location of his palace. Second Sister, the Ciele Vyrthandi. Maore Vyrthandi Oran de Ciele. Petrosse is the rocky mountains on the Faeron border. Second Brother, the Chardyss Vidar. Maorn Vidar Bourne de Chardyss. The vale between the mountains is called Moutelle. Third Sister, the Veirnt Skuld. Maore Skuld Heim de Veirnt has her palace at Eiron, the green valley. Her ward is Romert of Clan Letheina of the Enclave. Third Brother, the Thettis Harte. Maorn Harte Regnant de Thettis, whose palace is located at Bermarck, the forested area.